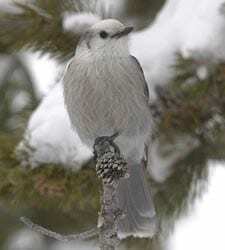 The deceptively cute Gray Jay is one of the most intrepid birds in North America, living in northern forests year-round and rearing chicks in the dark of winter. Highly curious and always on the lookout for food, Gray Jays eat just about anything, from berries to small animals. They may even land on your hand to grab a raisin or peanut. During summer they hoard food in trees to sustain themselves through bleak winters.